I started researches on birds in plantations in Indonesia in 2007. The main focus was on the avian diversity in acacia plantations of Company M in Palembang with which RISH (Research Institute for Sustainable Humanosphere, Kyoto University) had just started a joint study on acacia. The goal of my research was conservation of the biodiversity by management, as the decrease in biodiversity is a hot issue. Until then, I had been conducting fieldwork only in Japan and this was my first time to do research in Indonesia. I landed at Jakarta airport with a mix of 70% excitement and 30% anxiety as I had been told much about the difficulty and attractiveness of Indonesia from others. My first impression of Jakarta was the exotic aroma that pervaded the air, which I realized later was Gudang Garam. Palembang is a one-hour flight from Jakarta and the city once flourished as the capital of Srivijaya kingdom. Today, the city’s economy relies on crude oil, rubber plantations, and acacia plantations for pulp chips. The local camp site of Company M is a 4-5 hour drive from Palembang. In 2010, I started the cooperative project of CSEAS with Company S, which has its concession in peat land in Riau. Although I have no research experience in the concessions in Malaysia yet, I share my experience in Indonesia in the hope that it might help other members when conducting research with concession companies. Both similarities and differences in the collaborative system toward the research between Company M in Palembang and Company S in Riau provided interesting information on the company’s policy. Since the research projects are financially independent from the company, it is not easy to ask for permission and cooperation for the research. On the other hand, obtaining research permission from Company S was relatively easy. The company proclaims biodiversity as one of its corporate strategies and designates some parts of its concessions as Human-nature Interactions in High Biomass Society 2 biodiversity conservation areas. Therefore, biodiversity research of larger mammals and birds in the conservation area was welcomed. The study advocated the development of a new monitoring methodology and this held great appeal for them. Another problem that arose in the plantation research was the difficulty of obtaining maps. Company M strictly prohibits taking out of the forest physiognomy charts on which tree age information is clearly shown. This is because we could estimate annual timber production from the chart. If no maps are available, I have to make them by myself. This was a good opportunity for me to learn how to use satellite images by remote sensing to make land-use maps, but it was a time-consuming process. On the other hand, Company S allowed us to make photocopies of the forest physiognomy charts without any difficulty. I have no idea why this difference exists between the two companies. There were also clear differences between these two companies in the working style of the employees. Company M allowed its employees to take four days off after working ten consecutive days, since most of their employees’ families lived far from the working sites. This allows the company to have someone working every day, so I could conduct my research almost any day of the week. For Company S, it was a different story as many of the employees live in the neighborhood, so most of them took their days off over weekends. Although they could have more time off if they worked weekends, we seldom found anyone in the office on Saturdays or Sundays. At the early stage of the research our request to go into the forests on weekends was declined as no company staff was available. We insisted on going to the forest by ourselves but the company did not allow us to go without the guidance of the staff. Bird surveys usually start early in the morning (6:00 a.m.) but this request was also unacceptable for the company as the employees’ working hours were 8:00 to 16:00. We were at a loss as to what to do. After long discussions, we finally managed to obtain their cooperation on weekends by asking their supervisors to write a letter of support to help our research as part of their job assignment. With this formal instruction, they were able to have time off in lieu. However, there was still no way for us to go to forests early in the morning. I have experience of working with a logging Company K in Kalimantan for another project. In Company K, every day except for the national holidays was a working day. The logging site was located far from the town; we had to switch cars three times for the 11-hour drive. As the employees had to work in such a remote area, many of them brought their families with them. Employees of Company K didn’t complain about having to walk into the forests with us early in the morning. Sometimes we departed the camp at 5:00 and returned at 17:00. I should emphasize that we need to confirm the working style of the employees beforehand for smooth execution of the research activity. For inter-disciplinary projects, the research activities conducted by social scientists are sometimes declined when they conduct surveys in plantations or with logging companies. The policies on this issue were not consistent among the logging companies though. In 2008, we started to search for a candidate site for transdisciplinary field work in the Global COE program. The field of Company M, where our joint research had already been progressed, was the first candidate site. Although there was little problem with scientific research, the company was not happy with the social research on land conflicts and the livelihood of the local people. The company was in the middle of a strained situation with the local people caused by the confusion of the post-Suharto administration. Company M was highly skeptical of social scientists, since it believed that it was the research groups from overseas that had further complicated the land issues. Company S of Riau, on the other hand, approved the social researches in their field, although it was not very excited by the prospect. Therefore, we decided to launch joint research with Company S. It is unclear why they adopted such an open mind to social researches, but this large company probably has the capacity to deal with social researches, considering that they need to handle frequent criticism from environmental NGOs. Incidentally, Company K in Kalimantan surprisingly asked us to investigate the conf licts between the company and local residents, but this is a rare case. I guess they needed the performance record of social research, since they obtained a Forest Stewardship Council (FSC) certification, which needs to be assessed periodically for renewal. Rewarding of the workers is always a major issue. In the case of group research it is important to arrange the amount in advance, to avoid confusion among the members. When there is a large budget, we might consider paying a high rate. But this sometimes causes trouble. As is often pointed out, once the payment is fixed at a high rate, it becomes the standard and other research groups will be forced to pay the same rate. The best way might be to consult with the local counterpart in advance about the appropriate amount of payment. I had some problems with this issue while in the field. Among others, overtime payment puzzled me a lot. My understanding of overtime was to pay on an hourly basis when the workers needed to work outside of their regular working hours of 7:00-16:00. At that time, our bird survey was conducted from 6:00 to 18:00, so there were a few hours of overtime work each day. We took a few days off every two weeks, because I didn’t want to make the schedule too tight. At the first meeting with the driver and the company staff, I explained to them about the schedule and guaranteed that they would be paid extra wages for their overtime work, which might be approximately two hours a day. So, I recorded the start and finish time of the surveys every day. At the end of the survey, I showed the actual working time record and told them that the amount of overtime would be about 500,000 Rupiah (more or less 5,000 yen). But the driver calculated an amount that was three times more than that, which worked out to be 1.5 times that of his monthly salary. I asked the driver to explain but his claim didn’t make any sense to me. The hourly rate was much higher than my calculation, and working hours were almost double that of my record. It seemed that he had factored the no-working days and no-overtime days into his calculations. His explanations in Indonesian were difficult for me to follow, and I could not find a way out as I was running out of budget. It was Ms. M, a capable secretary, who solved this problem. She made me realize that I was totally ignorant of the business customs there. She pointed out that he was correct since it was calculated based on Indonesian labor law. She gave a clear and detailed explanation of the complex calculation of the overtime payment. In short, (1) if you employ someone for a certain period of time and guarantee payment for the overtime work, off days are included in the payment as well, (2) if you agree to pay two-hours’ overtime a day, then the payment for the first hour is X Rp (X = 1/173 of total monthly payment) but for the subsequent hours, the amount will be AX Rp (A was probably 1.5). In this case, the odds were against me. Ms. M kindly visited the car owner to explain the situation and asked him to overlook my mistake. She managed to settle Human-nature Interactions in High Biomass Society 4 the problem of the owner paying an extra amount of overtime work to the driver. I really appreciated Ms. M’s help on this. Since then, I always make sure that I am familiar with the overtime payment before I employ local people. When conducting research in foreign countries, communicating in the native language gives a great advantage to the researchers. It is not mandatory for the scientific researchers as long as you have a good interpreter. But it will help you and make things smoother if you can speak the local language. That was my attitude until I had a problem with communication. My first fieldwork assignment in Company M went quite smoothly. “Terima kasih” was all I could say so I had to communicate in English with local staff. Fortunately, the company assigned me with a member of staff, a young lady, who spoke fluent English; with her perfect arrangement and assistance I could finish my research activities without any problems. But the next time I went to the field, she had resigned from the company to study abroad. Since an English-speaking assistant from Bogor was with me, I was optimistic even though my Indonesian capability remained quite limited (I could manage to say a few simple phrases such as “There’s a bird on that deadwood.”) One day, after a week had passed, the driver disappeared after he went to the town to fill the car with gasoline. I could not go to the field without a car. He was not answering his mobile phone. The car was found later on a dirt road, destroyed, wrecked, laying on its side. The driver was not hurt by the accident, but he ran away as he was afraid of taking responsibility for the accident. The biggest problem was how to repair the rental car. It was difficult to believe from a Japanese perspective, but the rental car didn’t have any insurance at all! A necessary repair charge, about 90,000 Japanese yen in this case, was supposed to be paid half by the car owner and the other half by the renter. But according to the agent, the car owner was unwilling to pay half of the repair charge. The odds were stacked against me. The company staff was sorry to see me in deep trouble, and negotiated with the agent to settle that matter. But it was me who decided everything and signed the documents. The staff was very cooperative and kind enough to explain things in Indonesian until I fully understood. I had never been so eager to understand what they were talking about, and as a result, I learned lots of Indonesian words in a very short time. With their great help, it was settled that I would pay 45,000 yen for the repair cost. Actually, I had been given two options for rental cars for the fieldwork; a 4WD car, provided by Company M, with full insurance coverage but expensive, and the car that I rented. The rental fee for the 4WD car was about 250,000 yen for less than two months excluding gas. To save my research budget, I rented a cheaper non-4WD car from a rental car shop in the town (about 170,000 for two months). The lesson I learnt is that we should rent a 4WD car if we have to travel on dirt roads even though it’s expensive. As a result of these events, my Indonesian has improved slightly so that I can manage to perform simple tasks or negotiations. However, there is a negative effect of this. When people know that I understand and speak Indonesian, they approach me directly regarding their needs. 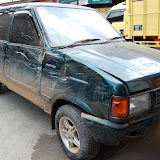 Most frequently, this consists of requests for borrowing money for vari- Photo2: A heavily-damaged rented car (photo by Motoko Fujita) 5 Planted Forests in Equatorial Southeast Asia: ous reasons; their children are sick, or they have lost their jobs. But there is one thing that is clear. If you lend some money to them, you will never get the money back. “Minta pinjam uang” is Indonesian for borrowing money, but I think it is more precise to say “minta kasih uang” which means “give me some money”. Collaborating with a private company is not mainstream in the area of ecological science. Moreover, when working with a plantation company, which is often a target of criticism of biodiversity decline, publishing the results sometimes requires extreme care. Natural forests have far richer biodiversity compared to plantations. First of all, the bird species that inhabit natural forests and plantations are different. In natural forests, birds that prefer deep forests are found and most of them are very cautious and shy. In plantations, on the other hand, most bird species favor open spaces. If most of the surrounding environments are natural forests, with little open spaces, those open habitats also may be an important habitat for birds. But now, natural forests are decreasing and open habitats are spreading. To conserve bird biodiversity, we need to preserve as much natural forest as possible. But how do we do this? Setting a large area of natural forest as a protected area is one way, or retaining a strip of natural forest along a small river is also possible. It is easy to criticize plantations, but what scientists should do is to record their impacts in a scientific manner, so that we know how to conserve biodiversity. Ultimately, fieldwork in tropical forests provides me with valuable experience that no other place can offer. Morning starts with the chorus of various birds, followed by gibbons echoing through the deep forest, and soon the forest is filled with the overwhelming power of wild creatures. Once the heat has subsided in the evening, the breeze will relax you. Although troublesome from time to time, I like the people and their way of living in tropical areas. To me, they seem to be very flexible and adaptable, possibly because of the ethnic diversity of their communities. In the tropics, there is something special that really attracts me, which I cannot find in Japan. Southeast Asia has been experiencing drastic changes in recent years, but I hope the landscape here continues to deserve the label “beautiful” forever. This entry was posted in Report of Research, 未分類 @en and tagged Bintulu, biodiversity, Borneo, Center for Southeast Asia Studies, Malaysia @en, Motoko Fujita, oil palm plantation, Ressearch Institute for Sustainable Humanosphere, swiftlet, tropical forest. Bookmark the permalink.